If you offer brussels sprouts or a forkful of kale to a child, he will probably gag. This is not so true for those who feast on their own tenderly nurtured school garden produce. Planting school gardens is spreading like weeds across the country. Even back in 2013, approximately 27 percent of elementary schools in the United States boasted school gardens. Students on a Navajo reservation in Leupp, Arizona, have a school garden. Living 45 minutes away from the nearest store, they wanted a closer source for food. They now plant many of their own veggies and fruits, like melons. But they discovered another problem. When it rains in Leupp, it pours—not just a gentle spring rain. The water comes in a deluge and then capriciously disappears for weeks or even months. The students learned that you have to make the most of every drop. So they helped put in a water conservation system that was made from an old industrial food-grade transport container. They salvaged the cleaned container from a water treatment plant, and it holds 275 gallons to help out in dry times. The students enjoy the harvest, but more than that, they have learned about where water comes from and how to conserve it. During harvest time, students trade their pitchforks for salad forks and enjoy a nutritious bumper crop, including carrots, melons, tomatoes, lettuce, kale, and apricots from one prized apricot tree. Another example of a successful school garden is the Carter School for the disabled in Boston. The children’s faces light up when they enter the garden. Teachers integrate garden activities into their curriculum. Working from wheelchairs, walkers, or adapted bikes, students can develop fine and gross motor skills while gardening. A big reward: They take some of the produce home to their families. 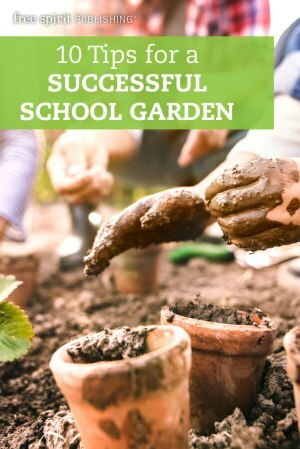 Your school garden can connect to curricular areas like math, language, science, health, social science, and more. You will see student improvement in teamwork, knowledge of content areas, communication, and community responsibility. So dig in. The bonus: Most of your students will not gag at their own hand-nurtured veggies. From garden to plate, students’ education, enthusiasm, and nutrition will improve one bite at a time. Check with your principal and faculty. Seek their support and cooperation. Brainstorm with your students or a student council about creating a school garden. Research. Kids should research the size of the garden, the best location for it, its nearness to a water source, and the types of plants that grow in your area (use the USDA Plant Hardiness Zone Map). You might also want to test the soil for contamination. If the soil is contaminated, you might plant a raised garden inside wooden beds. Also research district policies on giving or selling produce to cafeterias or others. Most schools will allow this, but will probably have a few rules. Students present their research and ideas to the faculty. The school might ask teachers to recommend one student representative from each class to serve on a garden committee. Or each class might be assigned a different garden responsibility. Students could list the plants that grow well in your area and ask classroom teachers to get student votes for which plants to grow. Assign jobs: Who does what and when. Decide who receives the produce. Be aware of regulations for donating to a school cafeteria. Purchase or receive donated seeds or plants from local nurseries. Parents or community members might also donate tools. Do you need potting soil? What else? You can also apply for grants from the National Farm to School Network, the Whole Kids Foundation, and Kids Gardening. Plant. Roll up your sleeves and dig. Maintain the garden. Assign tasks to individuals or different classes. Evaluate your project with your school and planning committee. Learn from mistakes and refine your plan.